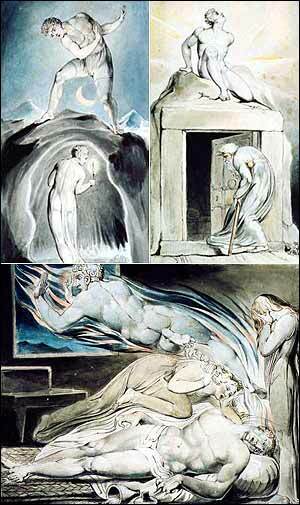 William Blake's illustrations for "The Grave"
Scottish poet, eldest son of the Rev. Robert Blair, one of the kings chaplains, was born at Edinburgh in 1699. He was educated at Edinburgh University and in Holland, and in 1731 was appointed to the living of Athelstaneford in East Lothian. He married in 1738 Isabella, daughter of Professor William Law. The possession of a small fortune gave him leisure for his favorite pursuits, gardening and the study of English poets. He died at Athelstaneford on the 4th of February 1746. His only considerable work, The Grave (1743), is a poem written in blank verse of great vigour and freshness, and is much less conventional than its gloomy subject might lead one to expect. Its religious subject no doubt contributed to its great popularity, especially in Scotland; but the vogue it attained was justified by its picturesque imagery and occasional felicity of expression. 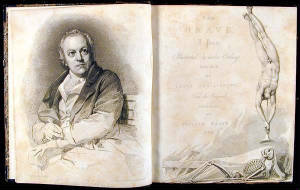 It inspired William Blake to undertake a series of twelve illustrative designs, which were engraved by Louis Schiavonetti, and published in 1808.